Memorial Day weekend is one of the highest travel holidays of the year. If you’re traveling, I hope you do so safely! I also hope that you have a wonderful and memorable time wherever your travels take you. I like to make little fun bags when we go on trips. We will be traveling with two sets of grandparents and my niece and her husband and two sons. I made a bag for each child and then a bag for each couple. I included the scavenger hunt I made. It had coloring books, colored pencils, cookies, crackers, Lara bars, a journal, mints, chips, personalized cups, candy that I know each person likes, Trivial Pursuit or Life, hand sanitizer, tissues, gum or mints, my current favorite book, Joan of Arc by Mark Twain, and a little shot of something for the adults to celebrate the arrival. The kids bags were similar with more junk food, no books from Mark Twain, and no shots of anything. The children loved their bags and the adults liked them too! Before we know it, it will be time to hit the road to head to our vacation. We are traveling with two sets of grandparents and my niece and her husband and two boys. I’ve already mentioned that I make little fun bags for the children; but I also like to make them for the adults too. These are not even all the snacks and little goodies I bought to put in the bags. I try to get a little something that everybody likes and things that are easy to eat in the car. The almond Snickers are all for my oldest daughter who is allergic to peanuts. Obviously, LBD won’t have any Jolly Ranchers in his bag. Hopefully, they’ll be something everybody likes in their bag! I’ll be sharing the full contents of the bag later. I love being a mom! I have found a different joy in being a boy mom which I had heard about but obviously never experienced until 2 years ago. 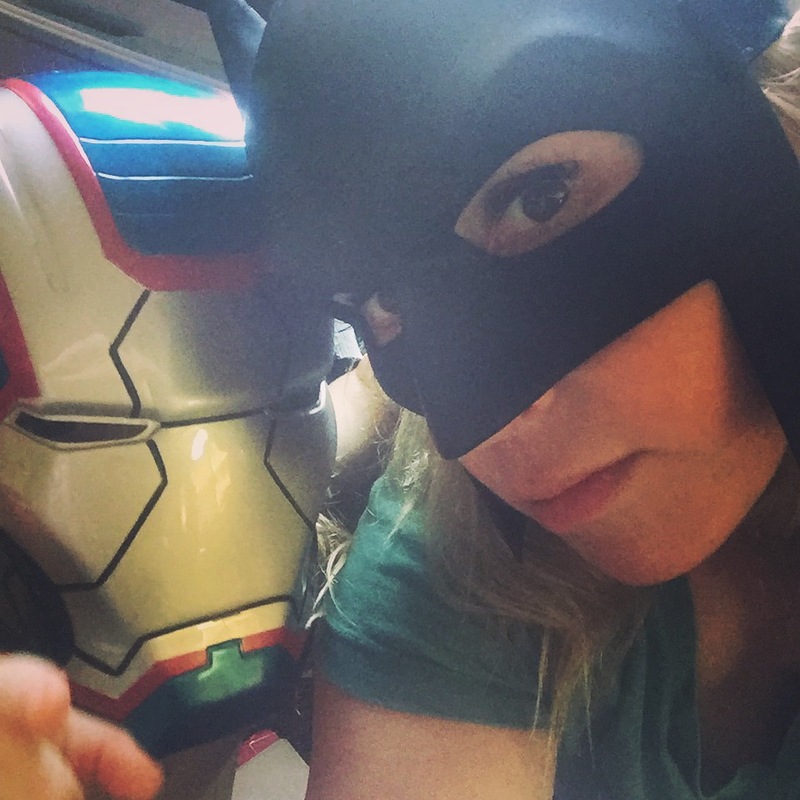 It seems like LBD came out loving all things superheroes. 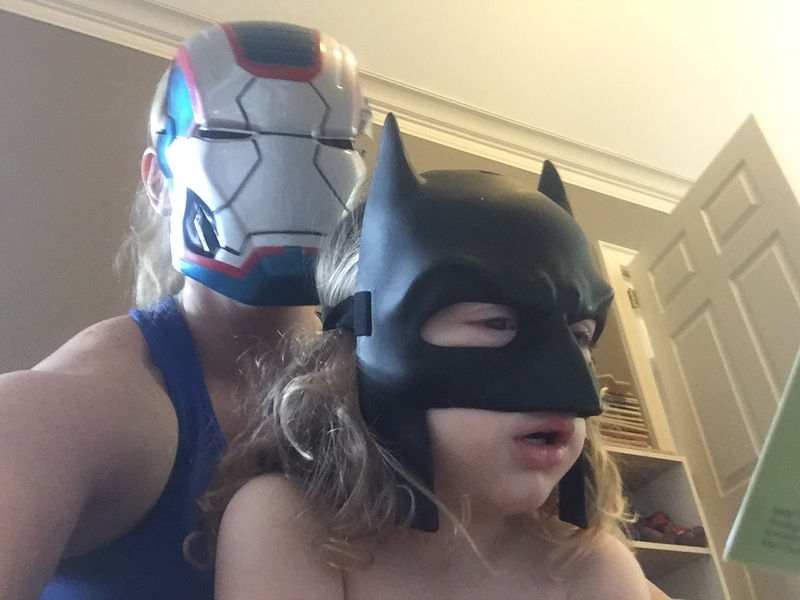 He asks for every mask he sees at the store and pretends to be one or more superheroes at a time all day long. I came across a video that made me laugh so hard. The joy in the Video makes me smile and it is the same joy I see on my boy’s face everytime we pretend. I hope you’ll watch the Video and laugh and smile too. Everyone needs something to smile about! Because traveling with so many people is very expensive, we usually save money on vacation by driving instead of flying. That means that there will be many hours spent in our car and many times the words, “I’m bored,” will be heard and said. I try to make little fun baskets for each child to keep them occupied throughout the drive. I pack one for the drive to our vacation destination and another one for the ride home. I will be posting more about those baskets soon; but wanted to share one of the things that I put in there for now. I made a road trip scavenger hunt. 5. car with a dog in it. Whoever finishes first wins a little extra prize that I keep up front. Feel free to copy and paste my little game and use it on your own road trip. Yesterday, we celebrated Cinco de Mayo with a very simple dinner and some homeschool lessons pertaining to the day. I got the worksheets from The Mailbox where I have a subscription, but they do have some worksheets for free. I made Margarita Chicken Dip, Frozen Margarita Pie, and Pina Colada Floats. I got the Margarita Chicken Dip recipe from a pin on Pinterest. The Frozen Margarita pie was super fast and easy to make. I tweaked a recipe I found on Pinterest to make it more to my family’s taste. Mix together the condensed milk, margarita mix, lime juice and zest. Then fold in the Cool Whip. Pour it all into the crust. Place in the freezer until you’re ready to eat it. The pina colada floats were just made with pina colada sherbet and Sprite. I hope you had a nice Cinco de Mayo as well! My girls really enjoy Star Wars. After I had the baby boy, they went over to my niece’s house and they watched all of the episodes over the course of a couple of weeks. I think they genuinely enjoyed the movies; but they also have that special feeling of being cared for to go with them. Since The Force Awakens came out, I think they have become even bigger fans. May the 4th was just naturally a day I wanted to do something fun. I looked over Pinterest for ideas. I wished I had gotten an earlier start because I saw lots of cute ideas that needed cookie cutters and other equipment that I just didn’t have on hand. We ended up with breakfast for dinner. This is not unusual. We usually do this once a week on our more hectic nights. The eggs were the Twin Suns. Cinnamon rolls were naturally Leia’s Buns. We had bacon and hashbrowns, which were a pretty terrible looking “Chewbaccon”. At least we got a good laugh out of it! The sausage links were Light Sabers. I made Yoda Soda which was basically just a lime sherbet float. I made Chewy cookies from Little Debbie Star Crunch cookies and added candy eyes and a frosting mouth and nose. I got that idea from Pinterest. I purchased Star Wars plates and napkins. I also got some Star Wars fruit snacks for little treats. The children all thought everything turned out really cute and I think they love a themed dinner as much as I do. I made all the signs and the framed “May the Fourth Be With You” sign using DaFont’s Star Jedi font. I love a good thick soup. If you’ve ever seen my other recipes then you know I like spicy too. This soup is thick and spicy and I love it! It is one of the easiest soups to make, so without further ado, here’s the recipe. I place all of the chicken in my crockpot with one taco seasoning packet and cook it on low for 6 hours. When the chicken is done, I shred the meat. I take out most of the liquid that is in the crockpot. I then put in all my other ingredients and stir. I cook it on low for as long as I need or until it is heated through. If I’m using my Dutch oven (like in the picture), then I will put it it in the oven at 180 degrees for a few hours. Yum!